I am searching for Iranian languages and I encountered this chart shows Scythian as a Northeastern language. On the other hand, my history course indicated that Scythians are a Proto-Turkic tribe. I've seen the same assertion in academic articles. The Turkish Wiki page supports the Proto-Turkic origin of the Scythians. What is the origin of the Scythians? Why do these sources differ so much? I'll try to answer the main (title) question, What is the origin of the Scythians? -- I am not qualified in linguistic classifications. The straight-forward answer is, as steppe nomads, they migrated west from Central Asia to West Asia (Pontic-Caspian steppe) -- their nomadic empire was given different names, Scythians (Greeks), Saka (Persian), etc. If we take modern-day Iran (linguistic identity) and Turkey (geographical identity), confusion will set in. The important thing is to NOT do this. There was an earlier question regarding Turkic people and the Mongols - where I explained the linguistic and biological genealogy (with reference to the Altaic languages). 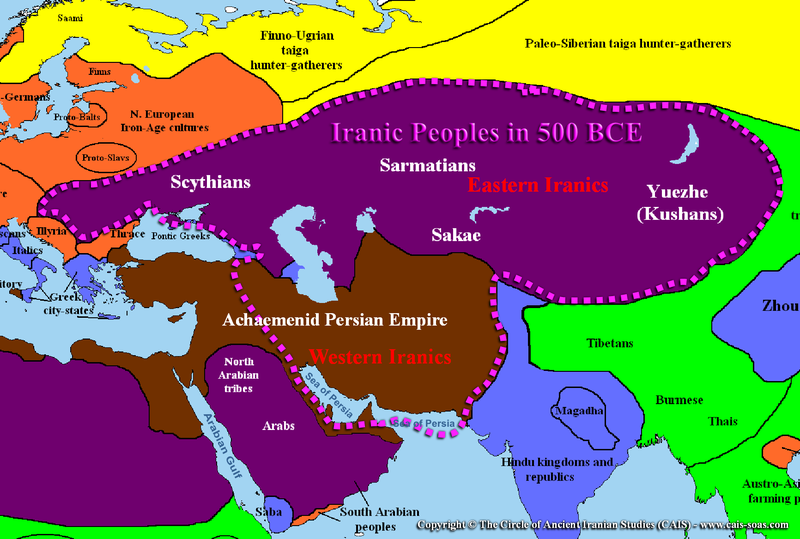 So we are looking much further back in time - 850 BCE, when neither Iran nor Turkey existed. A better approach is to look at it from a migratory perspective, i.e. where did they come from - "the formation and development of an ethnic group". The correct term here is ethnogenesis (i.e. origins). The Scythians are one of the oldest known Eurasian nomads. Like the Cimmerians before them, they migrated from the (central or eastern) Eurasian Steppe. In other words, they did not originate in Eastern Europe (north of the Black Sea). The many quotations of Herodotus, the "Father of History," says as much. Their original location was probably somewhere along the Kazakh steppe (also known as Central Steppe) and they eventually moved westwards to Pontic-Caspian steppe. Or, you could place their origin further east, along the Eastern Eurasian Steppe, say along the Altai-Sayan region. The predatory nomads who moved into the Pontic steppe after the departure of the Cimmerians were known to Herodotus as Scythians. They had, he believed, come from beyond the Volga, from somewhere in Central Asia. The archaeological evidence shows that the earliest Scythian burials, dating from the mid-eight to the fifth centuries (BCE), were scattered across the steppe across the steppe between the Don and the Danube with particular concentrations in the Kuban region north of the Caucasus, the valley of the Dnieper, on the Crimean peninsula, and along the coastal steppe as far west as the lower Danube. 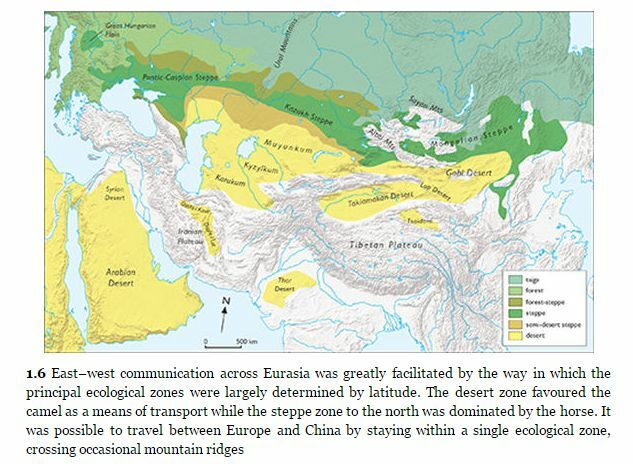 Source: By Steppe, Desert, and Ocean: The Birth of Eurasia (Oxford University Press, 2015), pp. 194-5. Migration is an age-old phenomena, in this case, a westward movement of the Eurasian nomads along the steppe corridor (map below) - from Manchuria (in the east) to the Hungarian Plains (in the west). The most likely causes for the frequent westward migration, like so many tribes before and after the Scythian, is warfare, pasture (for livestock) and trade. Turkic peoples are also from this region, hence the consideration that Scythian are Proto-Turkic (when they have not fully-developed their identity). The seat of the Turkic peoples -- like the Mongols (who are different) -- is further east in Orkhon Valley, modern-day Central Mongolia. Map 1.6, By Steppe, Desert, and Ocean: The Birth of Eurasia (Oxford University Press, 2015), at pg. 13. I have read the answer by T.E.D -- which is the only answer that seems worthy of consideration (the others are inchoate). We can learn a bit by what he is saying. In this, I hope to help clarify, not to repudiate, because I am no more qualified to answer this question than TED. And, more often than not, he is correct on history of linguistics of Eurasian cultures. (a) The entire point of TED's linguistic answer is based on a linguistic reconstruction of Proto-Turkic language. Naturally, the next question that follows is - can linguistics explain everything about a historical culture (Scythian, in this case)? How about archaeology? What of written histories by sedentary societies who interacted with the Scythians (Greek & Old Persian in this case)? If historical linguistics is so certain and absolute, why are we still having debates on the Indo-European languages? See this (Nature, 2015), this (GeoCurrents, 2012) and a forthcoming book (to be published December 2017, Cambridge University Press), The Indo-European Controversy: Facts and Fallacies in Historical Linguistics. I have an advanced copy of this book and I can tell you it tears into the Indo-European discussion very bluntly, in particular, the work of University of Auckland published here: "Mapping the Origins and Expansion of the Indo-European Language Family" (Science, 24 August, 2012 - Vol. 337, Issue 6097, pp. 957-96). I am not saying that linguistics is useless, but I am saying that one needs to be cautious with linguistic conclusions on historical matters. Hence, I stated specifically early on (above), that I do not want to go into details of linguistic classifications. (b) Still using the linguistic perspective, then TED added this quote: "Oghur (western) and Common Turkic (eastern) branches", coupled with his subsequent point that Scythians lived in West Asia (which most accept, see below). Again, naturally, the next question that follows is -- how do we know they lived there (West Asia) and (in my mind, more important) where did they come from?. We know where the Scythians lived because of elite burials, especially in the Kuban region. This is archaeology, not linguistics, and we now have physical evidence of the Scythians. Barry Cunliffe, is a British archaeologist and academic. He was Professor of European Archaeology at the University of Oxford from 1972 to 2007. Since 2007, he has been an Emeritus Professor. The source of the early westward movements of Turkic speakers was the turmoil associated with the rise and fall of nomadic polities in Inner Asia on the periphery of China. Turkic-speaking peoples, in some numbers are noted in the Western Eurasian steppes from at least the mid-fifth century (BCE) and very possibly somewhat earlier. These peoples came from the East; their probable ancient habitat was in South Siberia-Mongolia. Clearly, Oğuric-speaking tribes must have been in the Mongolia·Manchurian borderlands before the fifth century, and the Oğuric - Common Turkic division must have taken place by then. These correspondences constitute further evidence that the early Turkic-speaking community, before its various migrations, was located in the east, near Mongolic speakers. These Oğuric groupings represent some of the earliest Turkic peoples about whom we have some knowledge. None of them bore the ethnonym Türk. The Oğuric homeland is clearly in the east. Indeed, the Byzantine source Priskos (b. 410?, 420?, d. post 472) reports that the migration of Oğuric tribes to the Pontic steppes, where they came into the purview of Constantinople, began in Inner Asia, touched off by the expansionist activities of the Avars, ca. 450.54. Immediately prior to that, Oğuric tribes appear to have lived in the Kazakh steppe and Western Siberia, having come there from points further east - perhaps in late Xiongnu times. They may have already at that time been in contact with Ugrian peoples. At the time of their migrations, the Oğuric groupings appear to have been part of a larger, loose and still ill-defined confederation of nomadic tribes extending in an arc across Eurasia from Southern Siberia and Northern Mongolia to the Western Eurasian steppes. Therefore, it should be clear (to me anyway), Oğuric Turks arrived in Western Asia from Eastern Asia (i.e. in other words, they migrated). And to define them simply as "Oghur (western) and Common Turkic (eastern) branches" is to ignore their origins. The discovery of elaborate nomadic burials at Pazyryk in the Altai Mountains in the 1930s and later at Arzhan in the Tuva region gave new focus to the debate, and it has been conventional in the Russian literature to describe all these cultures as Scythian and to divide the time span covered into three phases: a pre-Scythian and initial Scythian period dating from the ninth to mid-seventh century; an early Scythian period from the mid-seventh to the end of the sixth-century; and a classical Scythian period covering the fifth to the third century. The first phase, which can be more conveniently called the formative stage, includes the Tagar culture of the Altai-Sayan region and the two burials at Arzhan, which, as we have seen, are the result of local developments from the indigenous Karasuk culture. It was in this region that horse-riding nomadism developed, associated with archery and Scytho-Siberian art styles. Since this distinctive package does not appear in the Pontic steppe until the late eight century, a logical interpretation would be to argue that "Scythian" culture originated in the Altai-Sayan in the ninth-century and spread westwards, reaching Pontic steppe during the next century. If this is scenario is correct -- and it broadly conforms to the views of Herodotus -- then we have to accommodate the fact that predatory normadism, practised by the Cimmerians, may already have been under way in the Pontic region, possibly even as early as the ninth century, before the Scythians arrived. In other words, Scythians may have settled in the Pontic-Caspian steppe, but they migrated there, from the paragraph above, from the Altai-Sayan region. On Scythians, we have Herodotus, Russian archaelogists, and now Sir Barry Cunliffe placing the origins (formative years) in either Central Asia or Altai-Sayan (East Asia?). But linguists, however, according to TED's reading of Wikipedia says otherwise, i.e. West Asia. On Oğuric-speaking Turks, again, Peter Golden places them in Southern Siberia - Northern Mongolia (east), but, again, Wikipedia says otherwise (west). The answer was prefaced with it is the mainstream view. I have no idea what is mainstream, but I disagree with Wikipedia in this instance. First off, I'm going to give you the mainstream view. "Scythian" was the name the ancients applied to the nomadic Iranian-speaking people living in the area north of the Black and Caspian seas (but often stretching as far west as Bulgaria) from about the 8th to the 1st century BC. Their language was quite certainly Iranian*. There is even one descendant language you can look at today: Ossetian. Proto-Turkic does actually have a fairly precise meaning. The Proto-Turkic language is the linguistic reconstruction of the common ancestor of the Turkic languages. It was spoken by the Proto-Turks before their divergence into the various Turkic peoples Proto-Turkic separated into Oghur (western) and Common Turkic (eastern) branches. One estimate postulates Proto-Turkic to have been spoken 2,500 years ago in East Asia. One thing should be fairly obvious here: The Scythians lived in West Asia, not East Asia. Also, 2,500 years ago actually post-dates most of Scythian history. These are two almost entirely disjoint sets of people. So the next question, who is arguing the non-mainstream positions, and why? What I found there is that there are two groups who today argue Scythians were "proto-Turkic": Pan-Turkists and Pan-Turanists. Both of these are political movements, not scientific ones. If either has any good evidence of an ancestral relationship between those two peoples, I was unable to find it in any English-language material. So what can we say about that history book you read? I guess you have two options. If you are interested in arguing for a larger pan-Asian national identity as a political goal, it's probably great. If you are interested in the mainstream evidence-based view of history, I'd suggest never cracking it open again. * - As an example, Turkic languages are agglutinative, Indo-European languages are not. It would be next to impossible to misclassify one as the other. The Scythians were a distant, illiterate people, and their language is not well attested. The origin of the Scythians was, for much of the 20th century, one of the enigmatic questions of Asian history. A variety of sincere hypothesis arose connecting them with Aryan, Turkic, and or Mongolian peoples. They were also proposed to be some combination of these, as is often the case with nomadic people. The Turkic ethnicity was refined over this period. There was originally a theory that there was an archaic Turanian race located between Caucasians and East Asians, but that is not longer in favor. There were also the Turanians of the Zoroastrian texts, who were a far-eastern Iranian people. They were enemies of the Aryans (but I think converted to Zoroastrianism at some point). These Tur- Iranians were often connected with the archaic Turanian race due to their location. Other reasons for the confusion were the varied opinions of linguists, and mixed genetics eastern Saka mummies. All of these things led to a lot of theories about the Scythians which are dated. These older theories get revived by Pan-Turkic supporters. The reason you will see a proto-turkic origin of the Scythians, is either because you are reading dated material, or pan-Turkic material. J.P. Mallory classifies the Scythian migration as phase two of the Aryan migrations. They spread from the same region as the first wave of Indo-Aryans did, 1000 years earlier; from the east of the Caspian Sea. There language is classified as Iranian, and branched out as far as the Khotanese (Tarim Basin), Pamirs (India), and Sarmatians (Ukraine). These were all a Scythian-like people. The best way to understand Scythian is as an era of steppe history, approximately from 750-250 B.C. Not the answer you're looking for? Browse other questions tagged ancient-history language steppe-nomads or ask your own question. Why are Turkish people and other Turkik people considered of Mongolic race if their language is not in the Mongolic language family?